Anat, also ‘Anat, was a major northwest Semitic goddess who was also worshiped in ancient Egypt. In Ugaritic her name appears as ‘nt and in Greek as Αναθ (transliterated Anath). She was a powerful goddess of war and fertility, honored as a protector, agent of vengeance, and bearer of life. A daughter of the chief god El, she was also the sister of the mighty Ba'al. She is prominently mentioned in the important Urgaritic myth known as the Baal Cycle as well as in ancient Egyptian monuments. In Egypt, Anat became important during the Hyksos period, where she was sometimes referred to as the Queen of Heaven. Anat's name is remembered in Hebrew tradition in relation to the judge Shamgar "son of Anath," the towns of Beth Anath and Anathoth, and patriarch Joseph's Egyptian wife Asenath. A Jewish inscription from the post-Babylonian period in Elephantine, Egypt, honors a goddess called Anat-Yahu (Anat-Yahweh). She is also associated with several deities of Greek and Roman mythology, especially the warrior-maiden Athena. Anat may also be seen as an example of the Warrior Maiden archetype, which has inspired numerous figures in mythology, literature and history. 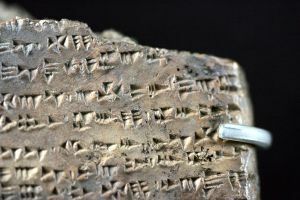 A major source of our knowledge concerning Anat comes from the Ras Shamra tablets, discovered in northern Syria in 1958, which record fragments of a mythological story known to scholars as the Baal Cycle. In these and other Ugaritic Ba‘al/Hadad myths, ‘Anat is the most active goddess of the pantheon, second only to Baal himself in power. She is a mighty war-goddess as well as the sister of the great Ba‘al. She is also a goddess of dew, love, and fertility. `Anat is addressed by El, the father of the gods as "daughter" and has frequent access to his abode. Her many titles include "Virgin ‘Anat," "Progenitress of Heroes," and "Kindred of the Peoples." Although she is consistently referred to as "virgin," Anat also seems to have been one of the two consorts of El who gave birth to Dawn and Dusk. She also serves occasionally as a wet-nurse to human heroes, thus imparting divine powers to them (CTA 15.II.27). She was supposed to be extremely beautiful, slender, and strong and to control deep underground water reservoirs. She is sometimes depicted as having cow’s horns, linking her both to her brother Baal, and to "Bull El," the father of the gods. The saga opens when Baal challenges the supremacy of the tyrant sea deity Yam, whom El has appointed to rule over the gods. When Baal proves victorious, he prepares a great feast. Anat prepares herself for this celebration by dying her hands red with henna, darkening her eyelids, braiding her hair, and putting on her finest adornments. She goes into the palace to the celebration, where there was meat and great vats of wine, and closed the doors behind her. She then slaughters the enemies of Baal. The Virgin Anath rejoices. She jumps with the feet and leaves the earth. Then She sets face toward the Lord of Saphon's crest by the thousand acres, yea the myriad hectares. … a house of silver and gold. A house of lapis gems!" Cuneiform script, (Louvre Museum) "Then Anat went to El, at the source of the rivers, in the middle of the bed of the two oceans. She bows at the feet of El, she bows and pays him respect. She speaks and says: "the very mighty Ba'al is dead. The prince, lord of the earth, has died"" (...) "They fight like heroes. Môt wins, Ba'al wins. They bit each other like snakes. Môt wins, Ba'al wins. They jump like horses. Môt is scared. Ba'al sits on his throne". She is thus the vanquisher of death, and Ba‘al—the giver or rain and life—will soon be reborn through her efforts. Father El now has a prophetic dream that "The heavens rain oil. The wadies run with honey." Joyfully, the "God of Mercy" realizes that Ba‘al will return to life. He commands ‘Anat to enlist Shapash, the goddess of the Underworld, to help her find him. Shaphash retrieves Ba‘al from Sheol and Ba‘al confronts Mot (who seems to have reassembled himself after being obliterated by Anat). Ba‘al vanquishes Mot, regaining his throne on Mount Saphon. Ugaritic text CTA 10 describes ‘Anat as joining Ba‘al and later giving birth to a young bull, which she presents to him on Mount Saphon. She smites the people of the seashore, destroys mankind of the sunrise. Under Her are heads like vultures. Over Her are hands like locusts. The Progenitress of Heroes, (washes) Her fingers. She washes Her hands in the blood of soldiery, Her fingers in the gore of troops. Did I not demolish the darling of `El, Yam the Sea? Did I not make an end of Nahar the River, the great god divine Rabim? While she is the heroine (although a bloodthirsty one) of most stories in which she figures, in the story of Aqhat, on the other hand, Anat plays a kind of villain. Aqhat son of Danel is given a wonderful bow and arrows which had been created for ‘Anat by the divine craftsman Kothar-wa-Khasis but was given to Danel for his infant son as a gift. When Aqhat grows to be a young man, the ‘Anat tries to buy the bow from him, offering even immortality, but Aqhat refuses all offers, calling her a liar, since old age and death are the lot of all men. He then adds to this insult by asking what a woman would do with a bow? Like Inanna in the ancient Epic of Gilgamesh, ‘Anat complains to El and threatens the old father of the gods himself if he does not allow her to take vengeance on Aqhat. El concedes. ‘Anat sends her attendant Yatpan, in hawk form, against Aqhat to knock the breath out of him and to steal the bow back. Her plan succeeds, but Aqhat is killed, which was not ‘Anat's intention. She rages against Yatpan, who runs away; and the bow and arrows fall into the sea. ‘Anat mourns for Aqhat and for the curse that this act will bring upon the land, as well as for the loss of the bow. The focus of the story then turns to Paghat, the wise younger sister of Aqhat, but it is unfortunately incomplete. ‘Anat first appears in Egypt in the sixteenth dynasty (the Hyksos period) along with other northwest Semitic deities. She was especially worshiped here in her aspect of a war goddess, often paired with the goddess `Ashtart, whose role was more strictly that of fertility. In the Contest Between Horus and Set, these two goddesses appear as daughters of Re and are given in marriage to Set, who may been identified with the Semitic god Baal-Hadad. During the Hyksos period, ‘Anat had temples in the Hyksos capital of Tanis (Egypt) and in Beth-Shan (Palestine), as well as being worshiped in Memphis. On inscriptions from Memphis of fifteenth to twelfth centuries B.C.E., ‘Anat is called "Bin-Ptah," Daughter of Ptah. She is associated with Reshpu, (Canaanite: Resheph) in some texts and sometimes identified with the native Egyptian goddess Neith. She is sometimes called "Queen of Heaven." 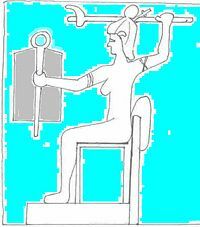 Her iconography varies, but she is usually shown carrying one or more weapons. In the New Kingdom Ramesses II made ‘Anat his personal guardian in battle and enlarged Anat's temple in Tanis. Ramesses named his daughter (whom he later married) Bint-Anat 'Daughter of Anat'. His dog appears in a carving in Beit el Wali temple with the name "Anat-in-vigor" and one of his horses was named ‘Ana-herte 'Anat-is-satisfied'. In the Hebrew Bible, the wife of the patriarch Joseph, was named Asenath, which may mean "holy to Anath." She is described as having been given to him by an unnamed Pharaoh who also gave Joseph the Egyptian name Zaphenath-Paneah. Antu or Antum is a Babylonian goddess, and seems to be a precursor of the Semitic Anat. She was the first consort of Anu, and the pair were the parents of the Anunnaki and the Utukki. Antu was an important feature in some Babylonian festivals until as recently as 200 B.C.E., but in general was replaced as Anu's consort by Ishtar/Inanna. The parallels between the stories of Inanna and Anat have already been noted. It has also been suggested just as the Sumerian goddess Inanna is related to her West Semitic counterpart, Ishtar, so in Canaanite tradition the two goddesses Anath and Astarte are closely linked, particularly in the poetry of Ugarit. In iconography it is often difficult for archaeologists to assign a name to a female deity holding a weapon or sheaf of grain, since such a description could apply to any of the above. The goddess ‘Anat is not mentioned in Hebrew scriptures as a goddess per se. However, it is possible that she may be confused with the goddesses Ashera and Astarte in the minds of the biblical writers. The term "asherim" is used frequently in the bible to refer to sacred pillars erected by Canaanites and Israelites alike, in association with altars devoted to both Baal and Yahweh. Nevertheless, Anat's influence on Israelite culture was significant. Joseph's Egyptian wife Asenath, named in honor of Anat, is traditionally believed to be the mother of Ephraim and Manasseh, and thus the foremother of these important Israelite tribes as well. The Israelite judge Shamgar "son of Anath" is mentioned in Judges 3:31; 5:6, which raises the idea that this hero may have been imagined as a demi-god, a mortal son of the goddess. However, John Day notes that a number of Canaanites known from non-Biblical sources bore that title and theorizes that it was a military designation indicating a warrior under ‘Anat's protection. In Elephantine (modern Aswan) in Egypt, Jewish mercenaries, c. 410 B.C.E., left documents that make mention of a goddess called Anat-Yahu (Anat-Yahweh) worshiped in the local temple of Yahweh, originally built by Jewish refugees from the Babylonian conquest of Judah. 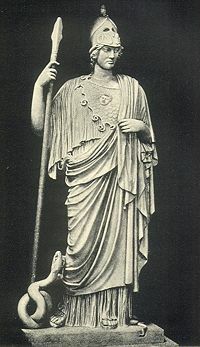 This photo-engraving from an 1899 book of an original statue of Pallas Athena found in Vatican City at Rome. This statue is also known as Pallas Giustiniani. It was found in the temple of Minerva Medica on Esquiline Hill. The Greek goddess seems to have evolved from the early Semitic deity Anat and appears carved from Parian marble. In a Cyprian inscription (KAI. 42) the Greek goddess Athêna Sôteira Nikê is equated with ‘Anat, who is described in the inscription as the "strength of life"—l‘uzza hayim). The connection between the two is not only evident in their characters as divine maidens of war, but also from the fact that the ancient historian Sanchuniathon calls Athene (presumed to be ‘Anat) a "daughter of El." The goddess ‘Atah, worshiped at Palmyra, may also be closely related to ‘Anat. Later, ‘Atah was combined with ‘Ashtart into the goddess ‘Atar‘atah, known to the Hellenes as Atargatis. If this origin for ‘Atah is correct, then Atargatis is effectively a combining of ‘Ashtart and ‘Anat. It has also been proposed that (Indo-)Iranian Anahita meaning "immaculate" in Avestan is a variant of ‘Anat. This deity may be more directly related to Inanna/Ishtar, however. By the same token, as seen above, Anat herself may have inherited many of the traits of her Mesopotamian relative Inanna. In the writings of psychologist Carl Jung, goddesses such as ‘Anat represent the Warrior Maiden archetype of the mankind's collective unconscious. This archetype has animated numerous figures in history, literature, and mythology. Examples include goddesses such as Athena, Diana, and Artemis; mythical beings such as the Valkyries of Norse legend and the Amazons of Greek story; and historical figures such as the first century Celtic warrior queen Boudica and the twelfth century "Maid of Orleans," Joan of Arc. Famous fictional warrior maidens include Éowyn, the Shieldmaiden of Rohan in J.R.R. Tolkien's The Lord of the Rings, and Princess Leia in George Lucas' Star Wars epic film. ↑ The text actually portrays Baal, not Anat as defeating the tyrannical Yam. ↑ Cory S. Baugher, Yahweh’s Conflict with the Leviathan and Sea, 2007. Retrieved June 1, 2011. ↑ John Day, Yahweh & the Gods & Goddesses of Canaan (Sheffield Academic Press, 2000, ISBN 1850759863). Article by Taylor Ray Ellison on Anat Mother of Gods. www.touregypt.net. This page was last modified on 17 November 2016, at 16:25.